Thanks again for participating in Sunday night's live edition of Planet Waves FM. I'm enjoying this new format and I hope that you are too -- it's been great to have the chance to connect with you directly. If you missed the live event, or if you'd like to review, you may listen to the replay here. I also want to remind you about our exciting new membership level to better serve you on a personal level. We're adding an astrology update service sent via text plus daily astrology emailed directly to you. You'll soon be invited to our brand new, beautiful, convenient members' website that will allow you to choose your own password to access members-only content. We're calling this enhanced service our Core Community Membership. 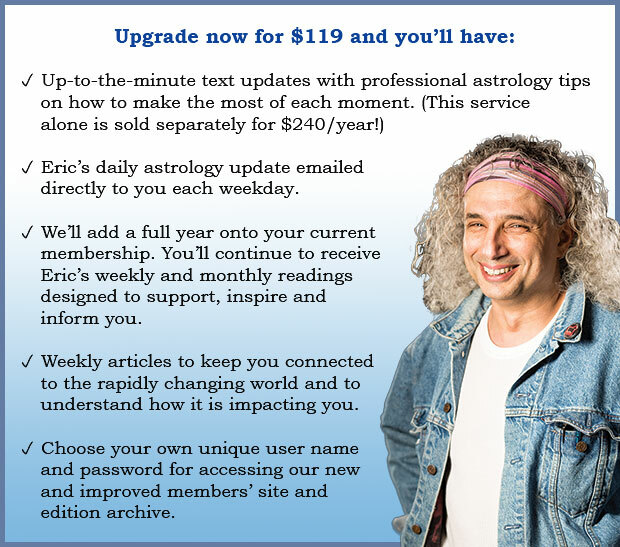 It includes features that provide professional level astrology services, prepared the way that only Planet Waves can do it. Sign up now and you'll be able to take part in the first teleconference for Core Community Members, called Mercury Retrograde: How to Talk About the Impossible. This happens Sunday at 7 pm EDT. I value the investment you've already made in Planet Waves -- and that's why I'm inviting you to upgrade and join our Core Community now at a special rate. You'll save $30 on the already low introductory rate we're offering non-members. Or you may call Chelsea at (877) 453-8265 or (206) 567-4455 to upgrade your membership by phone.